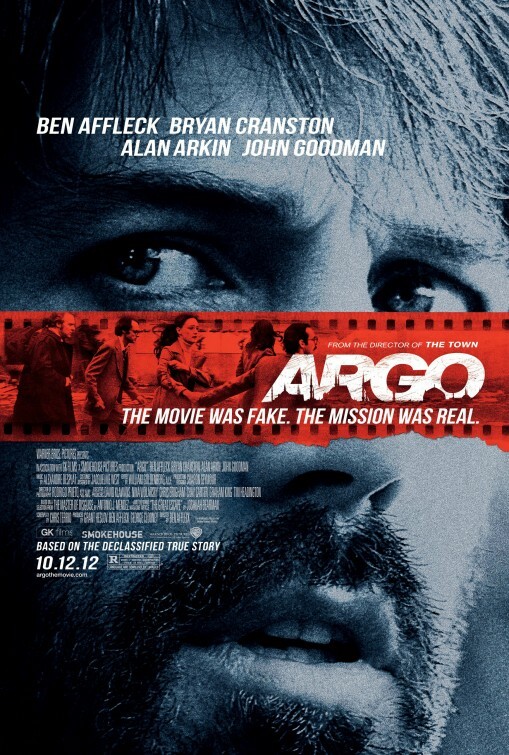 Synopsis: A homicide investigator digs deeper into a case involving a trained military sniper who shot five random victims. Review: There are times when reviews of films tell you to ‘lower your expectations’ as way to soften the blow of an anticipated/hyped movie to expectant audiences. With Jack Reacher, my direction to you may be to ‘raise your expectations’…because what we have here is an immensely entertaining popcorn flick that showcases another strong 2012 performance from Mr. Cruise. Cruise has gotten such a bad rap in the last few years thanks to his infamous couch jumping moment, his devotion to Scientology, and a string of movies that seemed to be vanity showcases rather than actual performances. The first movie I reviewed on this blog was my second viewing of Cruise’s Mission: Impossible – Ghost Protocol and it signaled a welcome change in the box office star. Perhaps humbled by middling box office returns of his high profile projects, Cruise seemed to come back to his Mission: Impossible character with a fresh attitude and relaxed stance. Now 50 years old, Cruise was excellent in an otherwise woefully miscalculated big screen adaptation of Broadway’s Rock of Ages this summer and he’s ending 2012 in perhaps his best performance yet. With Jack Reacher, it’s interesting that Cruise is once again at the center of a fan uprising in relation to him playing a loved character that he doesn’t exactly fit the description of. Like the movie version of Interview with a Vampire (when author Anne Rice famously spoke out against the casting of Cruise as the vampire Lestat but then more famously ate her words when she saw the final product) as written Cruise is nowhere in the vicinity of the 6’5”, 220 pound grizzled former Military Police Major originally conceived by author Lee Child in his series of novels. Having seen the film but not having read the novels, I can’t say that my ire was too up because Cruise dives headfirst into the role and relishes the chance to play a character with more grit than grin. This is a man who has seen the horrors of war and what it can do to people; he’s been in some dark places and can’t help but be affected by it. Instead of making Reacher a tortured, haunted soul, Cruise instead takes a more interesting approach, making him a straight-forward no-nonsense kind of guy – one that probably knows the answers to any questions he’s asking but is giving someone the opportunity to tell the truth before handing down justice. After winning on Oscar for writing the screenplay for The Usual Suspects, director McQuarrie has kept a fairly low profile these past years. His first time in the director seat in twelve years, McQuarrie does double duty as director and adapted the script with it’s wonderful ear for dialogue. McQuarrie has always had a way with words and certain phrases/exchanges in Jack Reacher are so on the money that my jaw dropped a few times in a mixture of delight and shock. Even with a nice zip to the dialogue, McQuarrie does stumble with more than a few awkward set-ups and clichéd circumstances that can pull the involved audience member back to reality. Most of these come courtesy of a pretty defense attorney Helen Rodin (Pike , Die Another Day) that employs Reacher when her client asks for him by name. Pike, who barely masks her UK accent by going for a gravely rasp (‘like a female Christian Bale’ my movie mate pointed out), has some great moments with Cruise but has just as many clunkers when left to her own devices to carry a scene. She’s always two steps behind the plot and the audience which can make for frustrating viewing. McQuarrie has packed his film with fascinating looking actors…many of them unfamiliar to larger audiences. Acclaimed German filmmaker Herzog even does a little acting here as a scary character named The Zec. It’s true that much of Herzog’s dialogue tends to the overly dramatic but coming from a man with missing fingers and a dead eye, it fits nicely. Courtney is an evil treat as a deadly sniper and there is good supporting work from Oyelowo and Jenkins as law and order representatives working against Reacher and Helen. Duvall shows up in a fun supporting role well into the films 130 minute running time…I would have maybe liked to see the Oscar winner as a surprise cameo because when a star like him is mentioned in the credits you start to wonder when he’s going to make his appearance. Pushing the limits of its PG-13 rating (which was generous considering some of the extreme violence), McQuarrie and cinematographer Caleb Deschanel don’t break any new ground with composition but they do stage some mighty fine action sequences…most notably a chase scene that takes us on a rough ride with Cruise around the city streets as he pursues a lead. With a very unobtrusive (and sometimes downright absent) score by Joe Kraemer, McQuarrie lets the scenes explode rather than merely simmer. The opening of the film plays a central part in the story and it’s a case of unfortunately bad timing. By no fault of the filmmakers, Jack Reacher is being released just a week after a terrible tragedy of gun violence that has much of the country reeling. The sniper event and other passages involving guns absolutely put me on edge and I found myself holding my breath on several occasions. Audience reaction to the film may be dampened by recent events but I urge you to not fault the movie for its unlucky release date. The character of Jack Reacher has surfaced in seventeen novels so far (this is based on One Shot, the ninth entry) and based on Cruise’s performance and McQuarrie’s invested direction/script I’d welcome the chance to see more of Mr. Reacher should this be the box office success Paramount Pictures is hoping for. After 2013’s Oblivion and All You Need is Kill, Cruise is rumored to be teaming up with McQuarrie for Mission: Impossible 5 so we may have to wait a bit…but if a sequel is half as good as this Cruise may have found another hit franchise he can settle into. Synopsis: Two young people journey through the dreamlike worlds of Cirque du Soleil to find each other. Review: Canada’s highly regarded Cirque du Soleil has spent the last several decades slowly expanding their artistry throughout the world. With sit down shows in Las Vegas, touring shows around the globe, or getting in early on the reality show bubble (Fire Within on Bravo), the group always seems to be first in line to try something and not have a fear of failure. They are really just trapeze artists without a net and that’s what has made their work so strong. Like their inventive stage shows, Cirque du Soleil: Worlds Away won’t be for everyone. The nearly dialogue-free film marvels maybe a bit too much at its own creativity…but in the end the striking visuals and surprisingly engaging stunts work their magic on audiences to help tell the tale of two young people crossing the dizzying Cirque worlds in their quest to be reunited. As is the case with many of their performances, Cirque du Soleil: Worlds Away begins with a pixie youth entering a world unfamiliar. Circus Marvelous is where the film begins as Mia (Linz) wanders around solo, catching the eye of a young Aerialist (Zaripov). It’s during his stage show that both Mia and The Aerialist find themselves swept away into an alternate universe from the creative minds at Cirque du Soleil. The Worlds Away are basically filmed segments from various Cirque shows around the world. Now before you dismiss this as a movie pieced together from clip reels let me say that what Cirque du Soleil did was go back to their shows to see what pieces would work best in the film and then adapted them to fit with the story. The thread that ties everything together is admittedly weak because it’s really just a way to get to a series of performances observed by Mia or The Aerialist…but as the film progresses it gets more interesting and focused. The first half of the movie is probably less “fun” than the second with more of the ribald and funny acts coming in after the halfway mark. The opening acts come from the shows O and Kà and there is no grandiosity lost as we marvel at the wondrous beauty of the merging of magic and water with O. Kà draws on visuals from imperial China with gravity defying stunts that are highlights of the film. Other sections are drawn from Viva Elvis, Love (The Beatles), Mystere, Zumanity, and more. More than a glorified 90 minute ad for the troupe, Cirque du Soleil: Worlds Away has another trick up its sleeve courtesy of an excellent use of 3D technology from director Adamson (The Chronicles of Narnia: The Lion, the Witch and the Wardrobe) and producer James Cameron (Titanic, Avatar). The movie was filmed in 3D so there is a striking amount of depth to the image that really does enhance the film experience. It’s worth the upcharge to take in the Cirque worlds that burst with color and rely very little on digital effects. I was worried going in that some of the tension of seeing a Cirque show live wouldn’t be present and was surprised that I was as involved with the film as I was. Though nothing can compare with witnessing some of the magic live, Adamson and his Cirque collaborators have done a smashing job with putting to film some of the crazier stunts that have been conceived. Using very little special effects is another selling point and helps the audience believe in the stunts they are seeing, creating the desired effect of actually being a part of the show. Cirque du Soleil: Worlds Away is an entertaining trek that allows audiences to experience the world of Cirque du Soleil from whatever city they may be seeing the film in. It starts off pretty ordinary but ends in typical Cirque fashion with a rousingly moving finale. You don’t have to go to Vegas or wait for a touring company to introduce you to the wonders of Cirque du Soleil. Though I highly recommend shelling out the dough to see them live if you ever have the chance, Cirque du Soleil: Worlds Away should fit the bill as a worthy substitute. Thoughts: It seems that Cirque du Soleil is absolutely everywhere today. With sit-down shows in major cities and several satellite troupes out on tour, the exposure of the Canadian circus group is as high as it has ever been. The company will get another jolt of attention when they release their collaboration with James Cameron and director Andrew Adamson (The Chronicles of Narnia: The Lion, the Witch and the Wardrobe) for this 3D fantasy poised to lure families who might not be able to shell out the hefty dough to see a Cirque show live. The trailer is visually stunning (of course) but it does leave me wondering what exactly the audience is in for and how the thrill of live performance will be captured on film. Considering the talent of all involved, I’m not too worried. Thoughts: Though the case of the West Memphis Three has been well-documented in the three Paradise Lost films, West of Memphis presents another look into the devious child murders that rocked a small town and the witch hunt that saw three men on the cusp of adulthood and the wrong side of the tracks be targeted as the culprits. Produced by Peter Jackson and Fran Walsh, West of Memphis looks to be another strong documentary arriving in theaters just in time to provide strong true crime counter-programming to the usual holiday fare. Sign me up. Synopsis: A bold, theatrical new vision of the epic story of love, adapted from Leo Tolstoy’s timeless novel. The story powerfully explores the capacity for love that surges through the human heart. As Anna questions her happiness and marriage, change comes to all around her. Review: ‘Tis the season for grand costume dramas adapted from classic literature and the holiday is off to a good start with this adaptation of Leo Tolstoy’s Russian drama of alienation, deception, and doomed love. 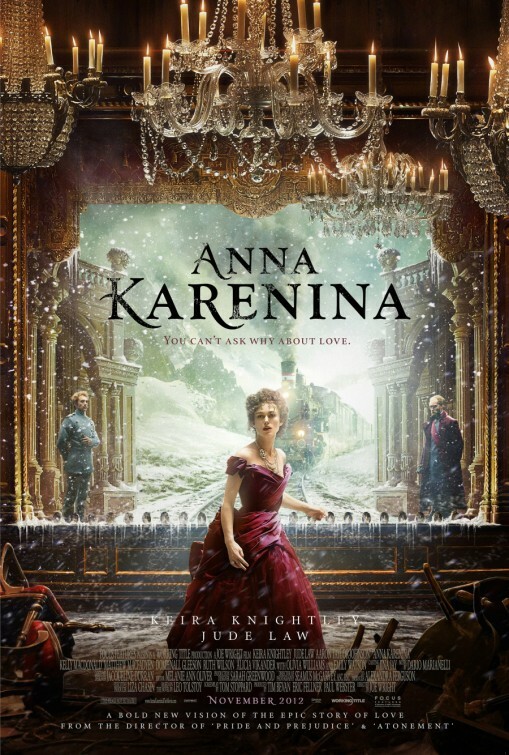 Though Anna Karenina has been seen on screens both big and small since film was invented, this 2012 version is ablaze with passion framed within a highly theatrical landscape that is both inviting and cold. Think Moulin Rouge! meets Merchant Ivory. Now don’t roll your eyes…Moulin Rouge! has its rabid fans as well as those that wrote off Baz Luhrmann’s 2001 musical as MTV hyper cut filmmaking but it reintroduced some needed theatricality into film that had been lost for some time. I consider Anna Karenina a sister film to Moulin Rouge!…meaning that if Moulin is the excitable sibling that can’t sit still, Anna is the lovelorn romantic that dreams of something bigger and better. Re-teaming for the third time after collaborating on Pride and Prejudice and Atonement, director Wright and star Knightley have brought in playwright Tom Stoppard to lend his distinct voice to the telling of this sad tale. Stoppard has cleared away some of the muck in Tolstoy’s hefty (but well respected) tome and let previously underplayed storylines come to the forefront with ease. Though the story is clearly centered on Anna and her affairs of the heart, under Stoppard’s pen we are treated to some beautiful moments from our secondary characters. Wright has consistently given Knightley her best work (and led her to an Oscar nomination for Pride and Prejudice) and Anna Karenina is no exception. I’ve found Knightley to be a hit or miss type of actress – her screeching performance in 2011’s A Dangerous Method almost broke the camel’s back and her work in the little-seen Seeking a Friend for the End of the World didn’t do her any favors . Thankfully, she’s ended 2012 with a searing take on the Russian wife swept away into a sea of deceit spurred on by an unfaltering love. Though she knows it will lead to no good, she can’t pry her heart out of the trouble it’s getting into. As the two men in her life, Law and Taylor-Johnson are interesting choices to stoke the fires of her heart. Law, with a balding pate and stuffy demeanor shows us his struggle more than he actually lets us see behind his cold exterior as Anna’s husband that tries to save her from ruin. Taylor-Johnson is the young buck who catches her eye and falls just as hard for her without remorse of consequences. It can be frustrating to see some of the choices our characters make…but our actors make these choices appear unavoidable. Secondary love stories are usually introduced for comic effect in classic literature but Stoppard has given a nice sheen to Gleeson’s courting of Vikander’s pretty princess. Though she only has eyes for Taylor-Johnson’s character, a shift in her heart happens on screen that is a wonder to behold – and it’s not just because Taylor-Johnson goes after Knightley instead. Gleeson and Vikander share one of the best scenes of the year…a wordless exchange where they literally spell out their feelings for each other. On its own, this Anna Karenina had all the elements to make a perfectly respectable motion picture but Wright takes it several steps further by setting the film in a theatrical environment that adds a magical touch. Largely set in and around the stage of an ornate theater, Wright lets the camera push through the scenery into a Narnia-like world that exists behind the curtain. Scenes are shifted in front of your eyes to new locations with striking detail. Production designer Sarah Greenwood should keep Oscar night free because her lavish sets and ornate design will earn her a nomination without question. 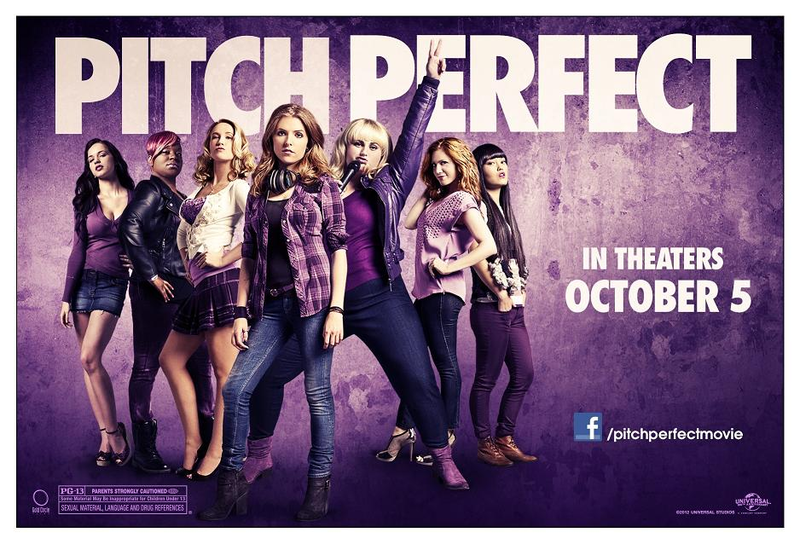 Even highly theatricalized, the film doesn’t seem gimmicky. It would have been so easy to take this too far and make the film much too strident in its artifice but it always seems to work like it should. Sometimes it feels like the concept has been forgotten but soon Wright sweeps you back into the backstage drama that plays out. Cinematographer Seamus McGarvey creates a hypnotic pulse that the film hums along to…a dance sequence is played out with breathless beauty that captivates you fully. It’s a film that has been on my mind as the days go by but be aware that, like Shakespeare, there is a period of adjustment you must get through with Anna Karenina. When the film began I wasn’t sure this was going to be something I would enjoy as much as I dd. The first fifteen minutes or so just spills over the audience and it’s up to you to hunker down and get up to speed. For those that do, you’ll find a clever and visually stunning film experience that is good fodder for a wintery day at the movies. Synopsis: It has been five years since the disappearance of Katie and Hunter, and a suburban family witness strange events in their neighborhood when a woman and a mysterious child move in. Review: Another year, another entry in the Paranormal Activity series. In 2009, the original Paranormal Activity made a stir because of its modest beginnings that turned a huge profit for its mother studio, Paramount Pictures. While the final product divided its audience (I loved it but know of several people that hated it with a passion) it was a no-brainer to put a sequel into motion. When the second entry arrived in 2010 a strange thing happened…a fast tracked sequel arrived that was solid and didn’t seem to be created simply to cash in. Number 3 is barely a year old and I still remember being pretty creeped out by it and its prequel ingenuity. What has set this series apart from the mindless Saw sequels is that with each new entry there has been greater insight given with each passing year. The central mythology of the story hasn’t been messed with and the sequels have added onto the baseline the original set…sort of like a cinematic Jenga game. After the last entry I felt like the series maybe had one good movie left in it before it was time to close the book on the found footage craze. Sadly, while it’s a solid sequel Paranormal Activity 4 seems to be the film that most represents a commercial spin from the studio. Now that they know they have a proven winner that they can make on the cheap and release every Halloween season, #4 represents a leveling off of the storytelling arc that I’ve respected in the previous sequels. It’s not so much a step back but a lack of motion that keeps this from really taking flight. Once again using a variety of different methods of obtaining/maintaining the found footage technique that has defined the film thus far, Paranormal Activity 4 moves the proceedings from California to Nevada. Our central family of four has their own problems that are only exacerbated by the new neighbors that might harbor some mysterious secrets. Though an eyebrow raising series of events, their new young neighbor comes to stay with the family much to the growing chagrin of the fifteen year old daughter (Lewton) that soon comes to realize something’s a little…off…about the boy. Lewton makes for a nice heroine and she’s well matched with Michael Cera look-alike Shively who contributes some nice moments of humor. There are attempts by returning co-directors Joost and Schulman (who also directed the fascinating Catfish) to give these people back stories but that tends to take a backseat to creating an ominous tone in every shot. The previous films have all benefited from using their repetitive shots of people asleep in their beds or going about their daily lives to play a nasty game of “spot the difference” with the audience. This has led to some clever scares as a result of nicely ratcheted up tension. Unfortunately that isn’t as present in this film and aside from a snazzy sequence utilizing features of the Kinect that are hidden to the naked eye, there isn’t the forward thinking motion and innovation that I’ve enjoyed in the previous entries. That’s not to say the film isn’t entertaining. It’s a helluva lot better than 90% of the horror films released in any given year and as well produced as a lower budget movie can be. At a trim 88 minutes, the film flies by with its abrupt start and end. Don’t arrive late to the movie because it starts up without any studio logo and ends in much the same way. A note…there are two trailers for the film. The first teaser trailer (attached above) is a little shorter and, like #3, involves a scene that is not present in the finished film. When I returned from the screening I watched the second trailer and was aghast that so many of the scares would have been ruined for me had I watched it before seeing the film. My best advice is to watch neither trailer before trekking to the theater…it will absolutely ruin some of the better moments in the film. The tagline for this entry is ‘All the activity has led to this’ and if that’s to be believed, it’s a sad harbinger of future films. The film could easily have found a way to wrap up its tale by building off of the strong finale of #3. Instead, I feel the film may have finally fallen victim to the studio system and decided to stretch the series out until it becomes unprofitable. There are worse movies you can see this Halloween season, though. If you want a very scary film…see Sinister. If you want a film with a few quality jump scares within a reasonably competent overall production…Paranormal Activity 4 awaits you. Synopsis: As the Civil War continues to rage, America’s president struggles with continuing carnage on the battlefield and as he fights with many inside his own cabinet on the decision to emancipate the slaves. Review: Steven Spielberg has long been attached to a film regarding the life of the 16th President of the United States. Abraham Lincoln’s tenure as President coincided with several key moments in our history – but what would be the best way to tell his tale? The answer? Make the focus of the film on the road leading up to the passing of the Thirteenth Amendment to the Constitution, outlawing slavery and involuntarily servitude. In doing so, Spielberg and screenwriter Tony Kushner (Angles in America) have made the film less biopic and more legal drama…and the resulting work is all the better for it. Any director worth their salt would be able to tell the story of how the young Abe rose from his very humble log cabin beginnings to become one of the most respected men in US history. Spielberg is no ordinary director and his commitment to telling human interest stories about the oppressed has been a staple of his movie canon dating back to Close Encounters of the Third Kind. Lincoln actually feels like a companion film to Spielberg’s 1997 Amistad in that both are stories about discrimination, fear, and salvation. 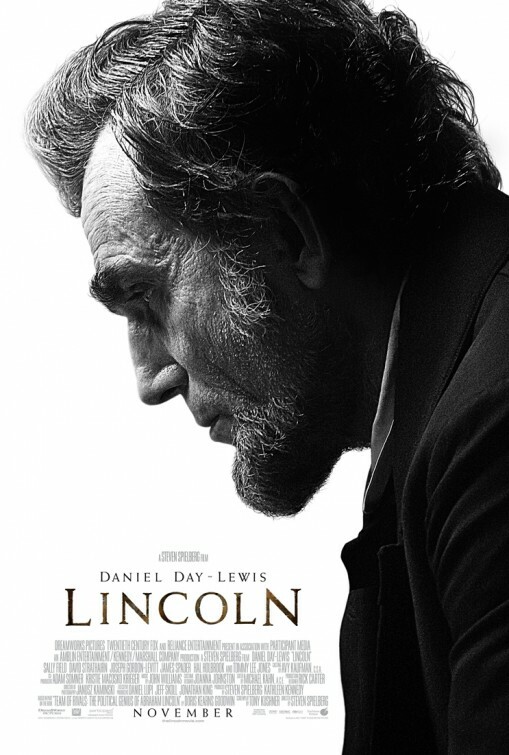 Long rumored to star Liam Neeson, the role of Lincoln was eventually handed to Day-Lewis. Known for his utter immersion in any role that he takes on, Day-Lewis is a man of many faces and facets but he plumbs new depths of his talents here. His Lincoln is a soft-spoken, gentle man that favors quiet direction to loud bombast. Without ever raising his voice he commands a room easily, listening with sincerity while others make their point or dispute his position. Without much to go from instead of first-hand accounts and photographs, Day-Lewis brings the aged Mr. Lincoln to life with a dexterity that’s pretty inspiring. Even his gait seems oddly perfect to how a man of his stature and slight awkwardness would have carried himself. Kushner has used parts of Doris Kearns Goodwin’s doorstop of a historical biography “Team of Rivals: The Political Genius of Abraham Lincoln” as inspiration for his wordy screenplay that at times seems like a series of monologues rather than a straight-forward script. That’s not saying that Kushner’s words lack for any power but on the other hand must every scene have a four page speech included in it? Lincoln was a natural storyteller, relaying his message via story or parable and Kushner hits the right notes in that regard. Still, in a movie that pushes the limits of 150 minutes it feels like two stories too many. What Kushner’s script does brilliantly is provide some exceptional moments for exceptional actors. Aside from Day-Lewis (who probably could have made a Lincoln book report from a third grader sound like poetry), there is Field as Mary Todd Lincoln and Jones as Republican leader Thaddeus Stevens, known as the Dictator of Congress. Field has been attached to the film from day one and at times I wondered if she were perhaps a titch too mature for the role. Going back and reading about Mrs. Lincoln I see that I was wrong…Field is more right than ever for the role. Often derided for her overly emotive style, Field works wonders with her screen time to give Mary (or Molly, as Lincoln affectionately called her) a backbone and frailty that surely made up the woman herself. Watch Field’s hands in her first scene and how they quake…an outward display of inner turmoil. Field also takes great delight in delivering one of the more enjoyable throw downs of the year to Jones’s Stevens while in a receiving line. It’s great fun that doesn’t feel out of place. Jones knocked it out of the park earlier this summer with Hope Springs and he brings that hound dog face and scrappy nature to the field here too. Stealing every scene he’s a part of, Jones reminds us why he’s one of the better actors working today and more than just the grumpy Gus he comes off as. Bewigged in what looks to be a Joan Crawford hand-me-down, Jones nonetheless doesn’t let that stop him as he holds his own defense of the Amendment in Congress while working with Lincoln to secure the votes necessary for it to pass. Like Field, Kushner has written Jones several wonderful speeches that he spits out with verve. Expect Jones to be nominated for (and possibly receive) another Best Supporting Actor Oscar. I’ve always been fascinated with Spielberg’s knack for casting. There are some films that he casts with almost total unknowns (like War Horse) and then films like Lincoln where he fills the screen with familiar faces. Spader, Nelson, and Hawkes are quite a treat as hired not quite semi-muscle tasked on the sly by Lincoln with scrounging up votes from members of Congress. Pace, Stuhlbarg, Holbrook, Jared Harris, and Jackie Earle Haley also turn in solid supporting roles as players in the game of politics. Gloria Reuben impresses in a small but heartbreaking role as an attendant to Mary Todd Lincoln. And the always dependable Strathairn is perfect as Secretary of State William Seward. These actors are only the tip of the iceberg in a cast that is uniformly in it to win it. The only actor that I was surprised that I wasn’t as impressed with was Gordon-Levitt as Lincoln’s son, Robert. Robert wants to join the war but is discouraged by his father and forbidden by his mother. As written, the character seems more of an angst-y John Hughes-esque character than any of the other characters Kushner has created. With his excellent contributions to The Dark Knight Rises, Looper, and Premium Rush, it’s not all his fault…he just feels out of place. I think the major problem lies with the feeling that this particular storyline feels a bit shoehorned into the proceedings to raise the stakes for Lincoln’s part in ending the war. Speaking of stakes, they are never higher than they are as the film continues to ramp up toward the vote. Anyone that has taken a History class should know how this turns out but that doesn’t stop Spielberg from keeping you at the edge of your seat during this extended history lesson. Some knowledge of the Civil War and its complexities would help, I think, add to the enjoyment of the film…especially in its fairly dense first half. Working again with longtime cinematographer Janusz Kaminski, Spielberg makes sure that each frame has exactly what he wants in it. That’s what I love so much about his work, he’s a smart enough filmmaker to deliver his movies precisely in the way he has envisioned them. When I see a Spielberg film I know that what I’m seeing on the screen is what Spielberg wants us to take in so I make a point to keep my eyes locked in at all times. Aided by another diverse score by John Williams that employs his usual sweeping fanfares and more music of the period, this really is a film that fires on all cylinders and impresses on many occasions. With Lincoln, Spielberg has presented to audiences another piece of US history that we may think we know the whole story on but wind up benefitting from more information. It says something about his prowess as a director that he can steer us into stirring emotions regarding pieces of history we learned about in our youth. Earlier this year I lamented in my review of the decidedly glum Abraham Lincoln: Vampire Hunter that that film actually had Mary utter the ominous line “C’mon Abraham, we’ll be late for the theater!” While the eventual assassination of the president is dealt with in Spielberg’s Lincoln too, it’s handled in a respectful way as only this caring director knows how to do. By that point the film had me swept away with its power and I admit to fighting back a swell of tears for our fallen president…and I didn’t feel manipulated into doing so either. An epic that all involved should be proud of, Lincoln took the long road to get to the screen and the final product is a film worthy to be called one of the best of the year. Though it is occasionally dry and a bit speech heavy, the performance of Day-Lewis is one for the record books. An Oscar nominee without question, I wouldn’t be upset if Day-Lewis picked up his third Oscar for playing Abe…honestly.